The E.J. Cole 1915 Cyclone was restored by Stephen Wright, author of the ‘American Racer’ books. Cole purchased this Cyclone at the Steve McQueen Estate Auction at Las Vegas’ Imperial Palace in November 1984, where it was offered as Lot # 636. This combination of Steve McQueen and Cyclone is unique in the world, and it is by far the most interesting motorcycle owned by the King of Cool. The Cyclone’s technical specification made it the most advanced motorcycle engine built in America, and while the company built road machines, it’s racing that Cyclone is remembered for. In its debut year of 1913, factory development riders JA McNeil and Larry ‘Cave Man’ Fleckenstein were timed at 108 MPH in a Minneapolis motordrome. 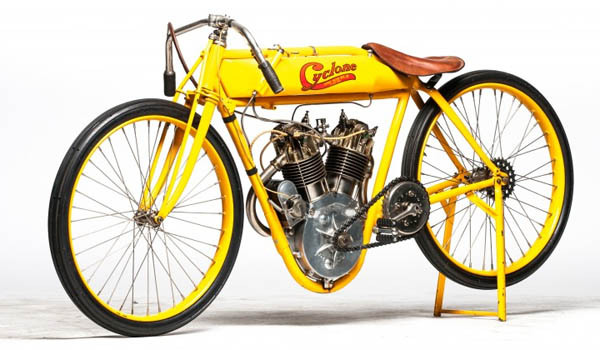 The next year, McNeil was timed at 111.1 MPH at the Omaha, Nebraska, board track, which was nearly 20 MPH faster than the internationally recognized world record of 93.48 MPH, held by Indian, and a 100 MPH mark timed by Lee Humiston on an Excelsior. Officials at the Federation of American Motorcyclists (FAM) simply could not accept the 111 MPH figure.